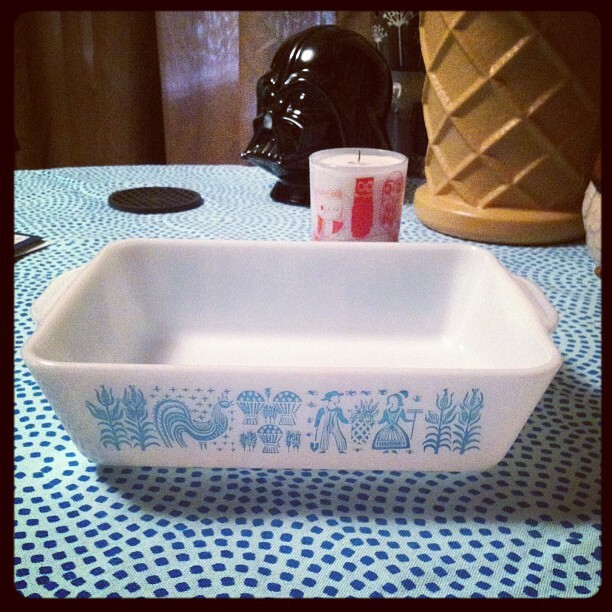 More Pyrex.. Yep, you guys saw that coming now didn't you? I truly have been limiting myself to the lovely pieces of cookware, but if I see something I like, I grab it up! Don't you? There's been a few more additions since I purchased these, but I have yet to take photos, so you get what you get. 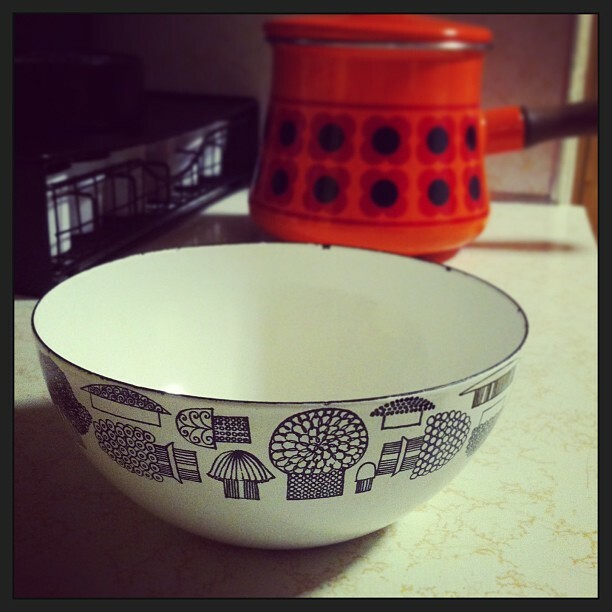 I have had a love/hate relationship with Dansk and Finnel enamelware for a while now. When I thrift or go to antique shops I try to limit what I spend on pieces, 8 is my limit at antique stores, and at thrift stores, if its over 5$, boy do I get pissy. I have become quite the haggler and always get prices lowered (woo hoo!) 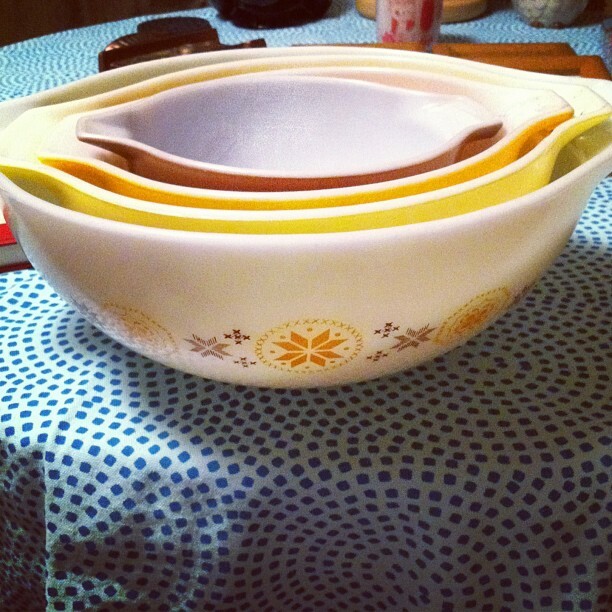 So, back to the enamelware, it is absolutely beautiful and I have always seen pieces for 20-200$, am I paying that? H.E.DOUBLE HOCKEY STICKS NO! I walked over to my favorite antique store and guess what I found? 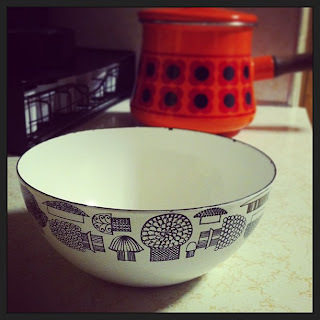 This cute little mushroom Finnel bowl for 1$ You weren't there, so I will tell you that I just picked it up, did not hold it close to my chest, and certainly did not call my Mom to tell her about this great find. Anyways, here is the little beauty. I love it! 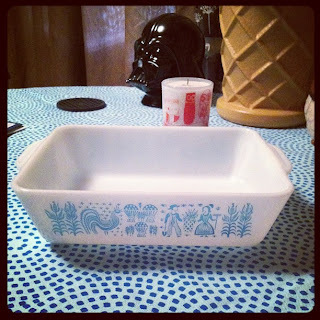 I also have a lovely Dansk pot and some other enamelware I'll have to blog about soon. I guess I have another collection on my hands? Who knows!